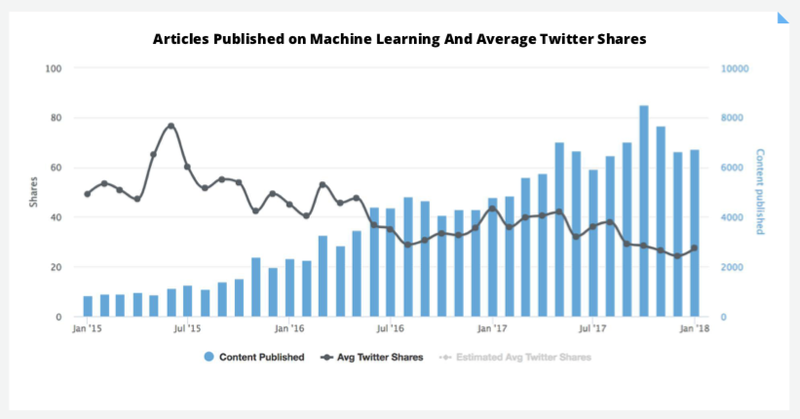 In 2018 Buzzsumo Proved Content Marketing Is Dying. In March 2018, Buzzsumo— a company that allows users to search for the most trending content online, released its annual report on the state of content marketing. Having reviewed 100 million articles published in 2017, they found that social sharing had halved compared to 2015. This trend has been building for a while now, and no-one is safe from it. Even back in 2015, Buffer was feeling the effects —stating that they were losing 50% of their traffic from social. This trend has continued for them in 2017, as it has for other companies highlighted in the report — Hubspot, Social Media Examiner and Moz. Now, it’s only fair to put that in context. These businesses are still doing very well — their content is getting more shares than 99% of other content out there. For example, HubSpot’s average shares were 753 in the period of 2014–2016 and it dropped to 590 in 2017. Now, that’s a significant loss but it’s hardly catastrophic for them. But, the vast majority of businesses aren’t in a situation where losing half of their social shares is no big deal. In fact, as the report shows, the vast majority of published content receives zero shares. The median number of backlinks in our sample of 100m posts published in 2017 is zero. In fact over seventy percent of all content published is never linked to from another domain. Given that link building is a key objective for many marketers, this should cause more than a little concern. We’ve hit a level of content saturation never seen before. Buzzsumo used the example of Bitcoin to illustrate how quickly popular topics get saturated. As we can see, interest in Bitcoin really started to take off in 2017, and by December 2017 there were 40,000 new pieces of content being produced on the subject every single week. Isn’t this just a drop in the importance of social as a source of traffic? Whilst it’s true that many sites have been hit by this drop in social sharing, there are others that have avoided this drop. Indeed, not only have some businesses not been affected by this at all — they’ve actually seen an increase in social sharing of their content. And herein lies the solution and strategy for the future. Buzzsumo noted that certain businesses bucked the trend. These businesses actually received more social shares as the numbers of published content increased. Buzzsumo noted that Coindesk had been established as an authoritative source of Bitcoin information long before Bitcoin took off in popularity. And, as such, their social shares increased as the amount of content increased as well. This is the complete opposite of what happened to the other publishers in the Bitcoin space. 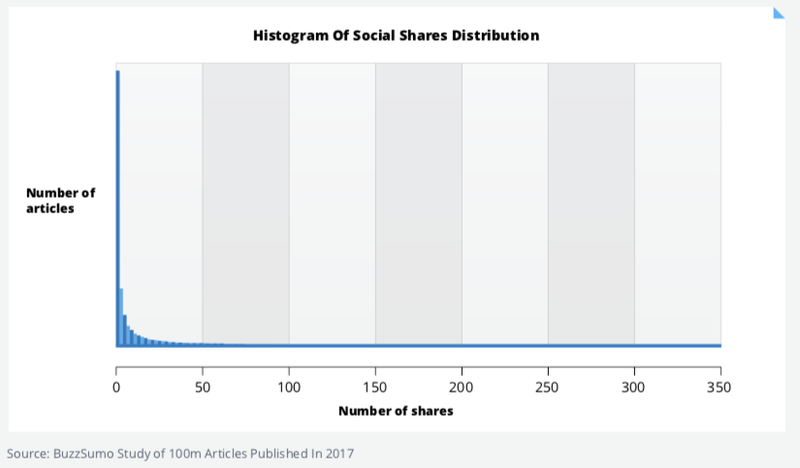 As the report points out, the average number of shares a Bitcoin article got in the 12 month period between 6 February 2017 and 6 February 2018 was 64. In the same period, the average number shares a Coindesk article got was 874. They were only beaten by the New York Times whose articles received an average of 2,300 shares. As a topic gets popular, a smaller and smaller number of websites get the lion’s share of the engagement. The fact that Coindesk was established as an authority a long-time before Bitcoin became popular, enabled them to be that website (beaten only by one of the world’s biggest and longest standing media outlets). Originality. New ideas in management are rare and precious — and one of the primary reasons readers turn to HBR. If you’re writing about a well-worn topic, we’ll be looking for a unique argument or insight. HRB readers get unique and original ideas from the publication, this is why HBR has seen an increase in the average number of shares of their content— from 4,007 in 2015/16 to 4,506 in 2017. Most published content simply parrots what other content already says, very little of it is original or has a unique perspective. For example - “cold email tips” produces roughly half a million unique results in Google. And much of this content repeats the same advice. This is why this content receives little to no shares and is most impacted by this drop in social sharing. Content that repeats what we already know is not going to get shared unless it is to convince others of our point of view. But, to continue the cold email example, no-one debates the importance of an attention-grabbing subject line in a cold email — everyone agrees it’s important. Content needs to be contrarian or different in order to capture people’s attention. Larry Kim wrote an article back in 2013 where he provided a different and contrarian point of view on Ebay’s PPC adverts. This, as WordStream points out in their blog, was one of their most shared pieces of content of that year. What matters more now than any other single thing is that what you’re saying is different–that it’s interesting, that it provokes some response from people. To use another example - Brian Dean, founder of the popular SEO blog Backlinko revealed in a recent blog post that his previous advice on YouTube promotion was completely wrong. He previously advocated for businesses to focus on quantity to build their YouTube channel — but to his dismay, he found this didn’t work when building his own channel. What worked for him was “high-quality content” — aka original and unique content. But how does one do that in a way that ties into your solution? After all there is no point in creating content on a topic that has no connection to your solution. After all, if you sell cold emailing software how can you create an authoritative site in advance? Cold emailing is not a new topic and everything that needs to be said about the subject has already been said a million times. How can you implement this in that situation? Let’s look at the company Drift as an example of how to do this. 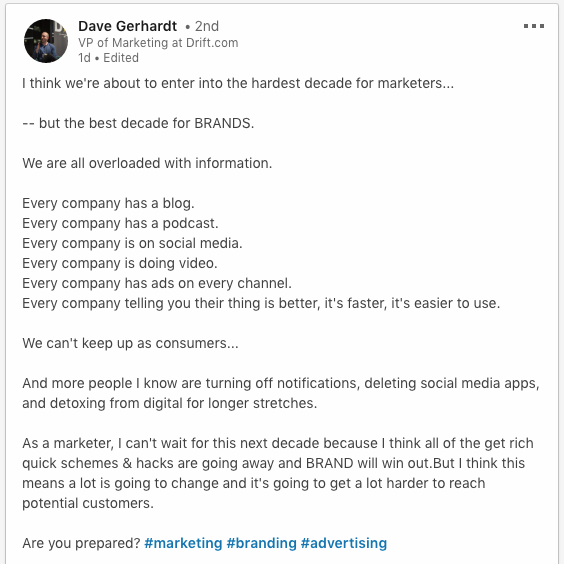 I recently came across this post on LinkedIn by Dave Gerhardt, VP of Marketing at Drift. As Dave points out, every single business in the world faces more competition for attention than ever before. Drift knows this and indeed based its business around this increased competition. As CEO David Cancel stated in his interview with Codementor, he deliberately sought out a competitive market because he knew that this meant there was demand. But this came with its own problems. When Drift launched they sold an AI (artificial intelligence) chatbot. The use of artificial intelligence in marketing — particular for website chat, was not exactly a new subject. So, rather than competing in a category and on a topic that was already saturated with information and competition, Drift carved out a brand new category by building their brand around an ideology and the doctrine of “conversational marketing”. They were still selling an AI chatbot, but now it was simply a tool with which to implement “conversational marketing”. This gave them a unique perspective — they were no longer talking about artificial intelligence and chatbots, they were now talking about “conversational marketing” — a brand new topic that was theirs to own. Have a unique perspective with original content — YES (they created the term — everything they said was new and it was “contrarian” because it goes against current wisdom on how to do marketing). This not only enabled them to create new and original content but had a host of other benefits — creating a new category for their solution within an extremely crowded market. This has enabled Drift to stand out from the noise and grow from zero to over 70,000 customers in 3 years. This approach is called Ideological Branding. This article here will show you how companies like Hubspot have used Ideological Branding to create massive growth. In the article linked to above, I do indeed use Hubspot as an example of Ideological Branding. And, as seen in Buzzsumo’s report, Hubspot has lost social shares. So how can I claim that this process (Ideological Branding) enables businesses to create share-worthy content that isn’t impacted by this trend in falling social shares? Well, Ideological Branding works to create shareable content because it creates a unique point of view and opinion for your business — one that runs contrary to the opinions of others in your market. As shown in the report, this is the sort of content that is not being affected by this trend. When Hubspot launched they built their business around the ideology and doctrine of “inbound marketing” — a unique point of view that ran contrary to the typical approach to marketing that everyone else was using (outbound marketing). But, these days, inbound marketing is no longer unique or controversial — it has become the standard strategy in modern marketing. Hence, Hubspot’s content is affected by this downtrend, because they are no longer promoting a new and original concept. Does this mean that Ideological Branding is a waste of time for this then? No. If your brand’s ideology becomes as popular as Hubspot’s (to the point where every single business in the world believes in it) then you’ll be facing the same “problem”. But until then, Ideological Branding will give you the framework to create unique, original and contrarian content that will ensure that your content rises above the noise. Former Global Marketing Director with over 12 years experience in marketing and sales, including work with Fortune 500 companies such as Microsoft, Oracle, Google and SAP. I help businesses implement Ideological Branding — a strategy that some of the world’s most successful businesses use to create massive growth and dominate their markets. This story is published in The Startup, Medium’s largest entrepreneurship publication followed by +396,714 people.